Another this week’s favorite item are those white sneakers, I have always wanted to buy a pair of sneakers like that! It could be explained by the fact that they are similar to Converse All stars sneakers, which have been on my covet list for a long time now! I think these could be a great/cheaper alternative! Hi there lovely! Really strong pieces, but the Happy necklace is so attractive! Great picks! I'd love a Minnie hoodie! Omg, that bag is absolutely beautiful and the watch too! I want this Mickey sweater (I love Mickey !) and the watch is adorable. The watch and the sneakers are my favourites! 🙂 As always your ebay bargains are very nice! OMG! These are so cute! Where do you find this stuff!!! i want it alll! i love that watch! it's so cute! omg that jumper is sooooo cute! Beautiful selection! We love the watch. Love that sweater and those shoes! That hoodie is so cute! 🙂 And I'm definitely buying the necklace! The mickey sweatshirt is adorable! I love all your picks! I will definitely check it out on eBay. 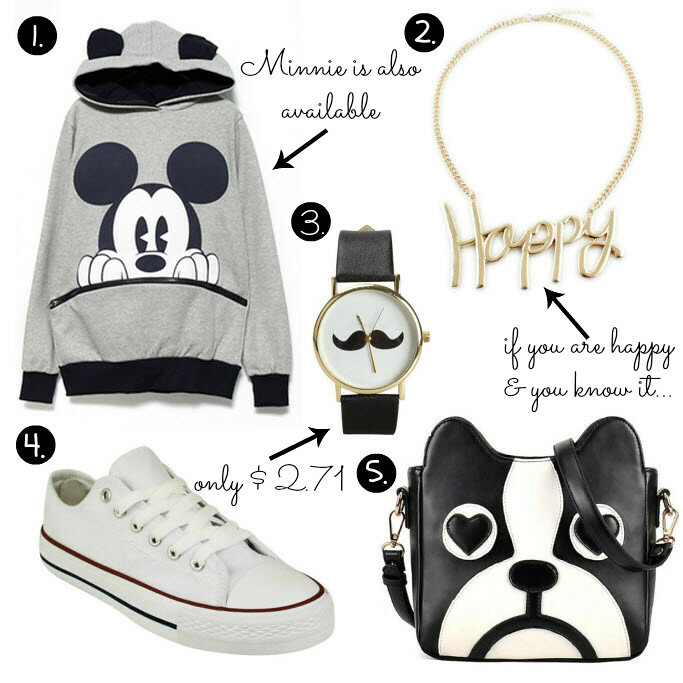 These are such cute picks – I adore the mickey pullover! The design itself and ears are so adorable!